Chubby Cherub was a game that appeared very shortly after the NES appeared on the market. Viewed by itself, it seems like a rather bizarre game. It appears as though you are playing as a fat cupid that must fly around eating food simply for the sake of being able to fly longer so that you can eat more food. The biggest threat to your life are dogs whose bark really is worse than their bite. And inexplicably, each level ends when you eat the piece of food that is beneath a window that contains some random kid's face. In general, to the American audience at which it was aimed, it made little sense, and the absurdity took away from the enjoyment of the game. To better understand Chubby Cherub, one needs to look at the original Japanese version upon which it is based. In Japan, the game was known as Obake no Q-Tarou: Wanwan Panic, which roughly translates to the Bow-wow Panic of Q-Tarou the Ghost. The cupid was originally a small odd-looking ghost, which doesn't make a lot more sense, until you consider that the game is based on a popular Japanese anime and manga about Q-Tarou the ghost and his child friends. The very same children that you end up rescuing at the end of each stage, sometimes from a burglar. The game was originally developed for fans of the series, which Americans had no knowledge of. So the developers changed the ghost to something else that westerners would recognize as a character that could fly through the air. They chose a cupid that they named Chubby Cherub. Among the other things that changed from the Japanese version to the American version, was the changing of the tiles from Japanese characters to ones with English letters on them, the title screen, and the difficulty was decreased. The power meter of Q-Tarou decreases much faster than the same meter for the Cherub. 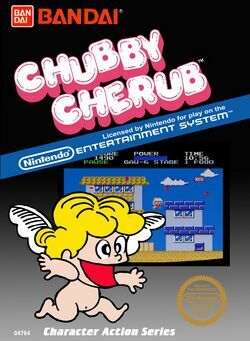 In the end Chubby Cherub did not compete well against more recognizable titles, and games like Super Mario Bros. that garnered much more attention (despite being just as unusual on the surface), and is not remembered fondly by many players. Chubby Cherub/Q-Tarou the Ghost must travel across 12 stages in order to rescue 12 young friends, while devouring food that floats in the sky in order to maintain enough strength to continue flying. If the power meter dips too low, you'll have to walk on foot until you can eat more food. Eat lollipops to turn the tables on dogs, and bark at them before they bark at you. You control Chubby Cherrub/Q-Tarou the Ghost as you travel to the right across every stage. If you press and hold the jump button, you will proceed to float in the air. You can fly through each stage as long as you possess enough power to sustain flight. Collect more power by eating food. You lose one life if you collide with any enemies, or get hit by a dog's bark. Half-way through each stage, a stop sign appears and you must eat all of the food to reveal a clue before continuing on. At the end of each stage, you must find or rescue a child. There are 12 children in all. This page was last edited on 13 October 2007, at 01:44.